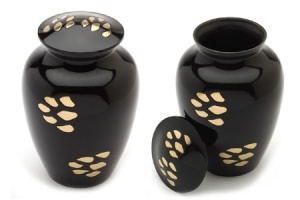 Bedford Black is a beautiful classic pet ashes urn for your dog's cremation ashes. 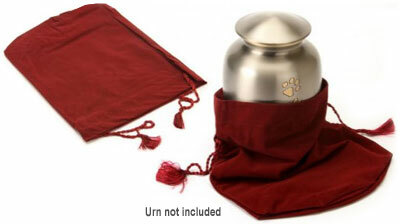 Each pet urn has a secured lid ensuring a safe place for your pet's ashes. Can be kept as a tribute and memorial or used as a burial urn. A beautiful and dignified place of rest. High quality solid brass urn, hand casted and intricately hand designed by skilled artisans. Finished in glossy black with gold coloured paw prints design. Your pet's ashes can be safely placed in the urn via a threaded secure lid. An optional red velvet drawstring pouch is also available to purchase. Size medium. Dimensions 26cm x 23cm (approx 10 x 9 inches). Not an exact fit. One size fits all. 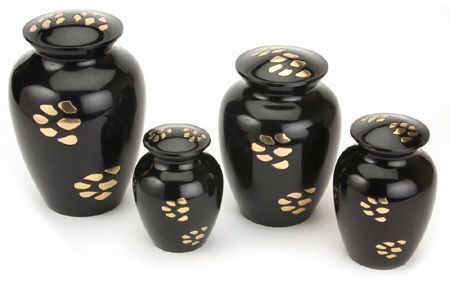 Suitable for approx 5 inch to 8 inch and heart urns.